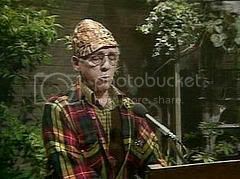 I’ve just learned that Ivor Cutler passed away last Friday. Quite disgusted that there was no mention of it on the news (even the local Scottish news) – unless I blinked and missed it. He was a true original, and has left behind a legacy of wonderful work. It is a great pity that he did not have a wider audience – the world could use more like him. Although I had heard mention of him over the years, I had always put off investigating him as I’m not really a great lover of poetry in general, which is how he is usually remembered. I’m pleased to say that I finally rectified this a couple of years ago and discovered that he had so much more to offer. A fantastically drole sense of humour, a surreal and childlike appreciation of life and some of the funniest mournful songs I’ve heard. Things like “Where the river bends, the blind men fall in”. All performed in a strong, but soft Scottish lilt accompanied by a wheezy harmonium. A breath of fresh air in a crazy world. He will be missed.